Black Belt magazine is reportedly one of the longest running publications in the area of self defense and martial arts in the US. 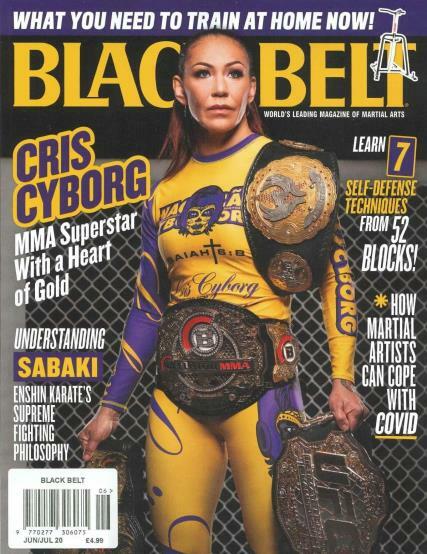 Buy a single copy or subscription to Black Belt magazine. Black Belt Magazine is reportedly one of the longest running publications in the area of self defense and martial arts in the US. Famous marial art practitioners like the legendary Bruce Lee have contributed to the publication over the years. In Black Belt Magazine, you will find articles on a variety of martial art styles and combat sports, interviews with professional martial masters, owners of martial art schools and celebrities, and discussions of martial art techniques. The types of martial arts covered in Black Belt Magazine include judo, karate, taekwondo, hapkido, jiu jitsu, jeet kune do, kung fu, aikido, pankration and kune do and other traditional martial arts, and mixed martial arts training. In addition, you will find information on martial arts weapons, the history of martial arts history and philosophy. The emphasis of the publication is on self defense, and in particular, military and police self defense combat. I subscribe to the Black Belt Magazine. Not only is it packed with all the latest news on martial arts and sports disciplines, it contains mini masterclasses to enhance the beginners skills, articles of interest from reknowned experts, tips and advice from other practitioners, blasts from the past plus features on fitness and health supplements. Generally an excellent all round read for the practitioner and the expert alike!